The goal of this post is to walk through configuring vRO to leverage HashiCorp Vault (https://www.vaultproject.io/) for reading secrets that will be used as part of our example workflow. The first thing we need to do is take a look at the API documentation for Vault to determine how we can interact with Vault using REST API calls from vRO. HashiCorp provides us with excellent documentation (https://www.vaultproject.io/api/index.html) to help make this very easy. After looking at the API documentation quick start (https://www.vaultproject.io/intro/getting-started/apis.html) we’re provided with an example curl command for reading a secret. The command below is extended to incorporate how the command would look with an actual token as well as the secret path that we’ll use in our example. 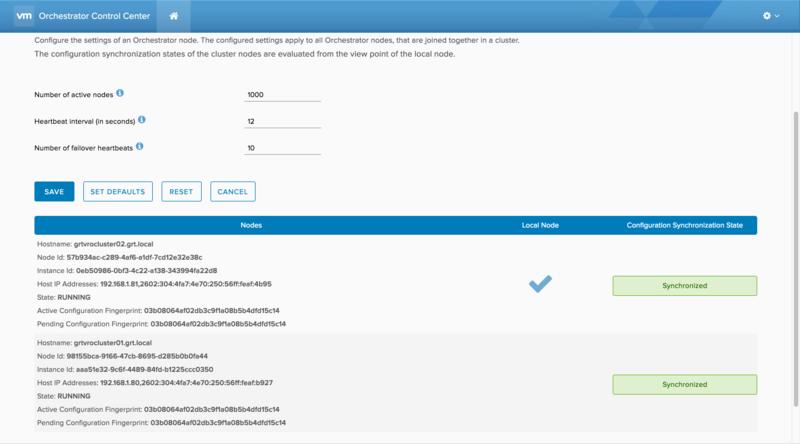 Vault supports a number of authentication methods like username/password, TLS certificate and several others but for this example we’re going to use default token based authentication. To support token based authentication in our REST API call from vRO we just need to include our token as part of the request header. In our example we’re using a “vaultToken” secure string input parameter to provide flexibility. Now that we’ve walked through the header used for authentication we’ll focus on the server or host portion of the URL used in the curl command. The parts we’re concerned with are the server hostname or IP address and the server port number. We’ll create two additional input parameters “vaultServerHost” and “vaultServerPort” and from those we’ll compose the full URL used for the Vault server API call. The last portion of the curl command that we need to address is the api specific portion that contains the API version, vault secret path and finally the name of the secret we want to retrieve from Vault. The “/v1/secret” is static so we’ll hardcode it and create an input parameter named “vaultSecretPath” to specify what secret we want out of vault. To test this the previously discussed input parameters need to be created, bound to a Scriptable Task that contains the code from the beginning of the post and then we can run it to see our secret from vault. If the workflow ran successfully we should be able to see the secret printed out to the log. This is for example purposes but secrets should never be printed out in plaintext. This example walked through a small portion of what’s possible with vRO and Vault integration but the benefit is immense as it enables Vault to utilized for centralized secrets management and vRO to harness that capability.